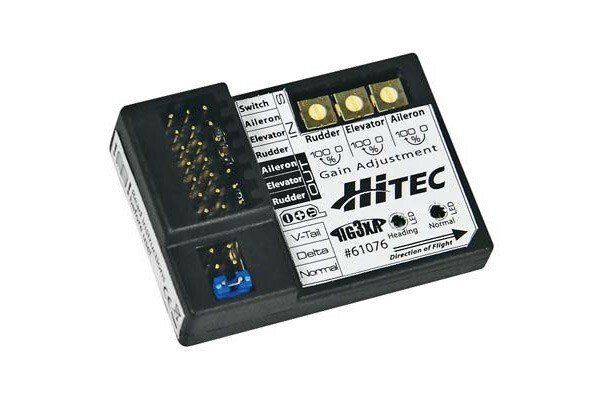 Hitec is excited to offer the compact HG3XA gyro for all your standard wing, delta wing and v-tail aircraft. This lightweight, three-axis gyro provides high performance stabilization, increased precision and smooth navigation in the most challenging flight conditions. The HG3XA gyro’s accurate angular motion detection will instantaneously improve your 3D performance, making hovers, torque rolls, harriers and knife edge passes easier to master. Three trimming potentiometers allow you to separately adjust the gyro gain of your aircraft’s aileron, elevator and rudder. Toggle between three different flight modes while your model is airborne: “off”, “standard” and “heading hold” mode.